Home > Pets & Animals > Other - Pets & Animals > Panda Cow Photos? A rare panda cow was born in Colorado. The miniature calf has markings that look much like a panda bear hence the name. The tiny cow was born on a northern Colorado farm in Larimer County. The farmer who made the calf raises miniature cattle and also owns a miniature kangaroo on his hobby farm. The panda cow, a product of genetic manipulation, is thought to be one of only about 24 in the world. Panda cows can sell at auction for $30,000 because of their demand as unique pets. The new calf is named Ben and, in five to six months, he will be sold. I was surprised when I saw it on TV, it really looks like a panda bear. Are there pictures of the newborn panda cow? The panda cow --an uncommon cross-breed -- was worked on for 44 years by Richard Gradwohl, a Covington, Washington, farmer who used eight different miniature cows to create the new breed. The tiny cow was born Friday with a white belt and a white face with black eyes—bearing a striking resemblance to a panda, and now one of only 24 so-called panda cows on the planet. The miniature panda cow is the result of genetic manipulation. The mini-cattle are bred solely as pets and can be welcomed into owners’ homes without causing any mayhem. 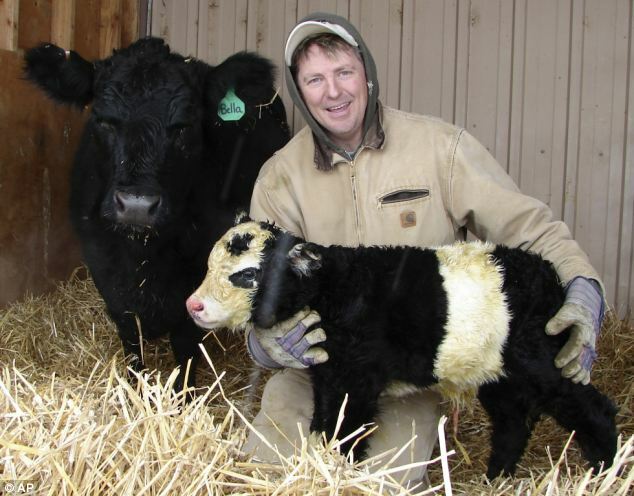 Here's a photo of Colorado farmer Chris Jessen holding his new 'panda cow' named Ben. Similar Threads for: Panda Cow Photos? Panda Tai Shan Leaving: Tai Shan Return To China? PHOTOS: Tiger Woods Vanity Fair Photos?